Jimmy Woo is a magnificent two storied nightclub in Amsterdam and is famed for its scintillating and exciting parties. The destination sees a lot of tourists all year round due to its picturesque location and good music. Visit the pub and enjoy to the fullest with your family and friends. The destination is also known for its drinks and food pallet that is sure to satisfy you. Prices may depend and can be known locally. Take a tram from Amsterdam, Leidseplein. How popular is Jimmy Woo? 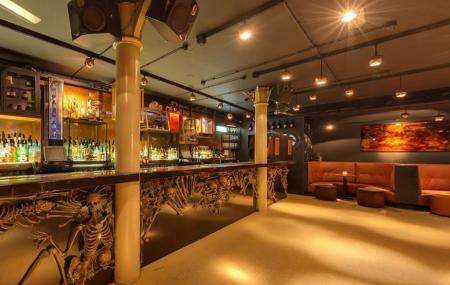 People normally club together The Amsterdam Dungeon and The Hash Marihuana And Hemp Museum while planning their visit to Jimmy Woo. People also prefer to end their day with Jimmy Woo. Of all the places in Amsterdam, THIS IS THE PLACE! This is where you seriously want to go to have a great time, beautiful inside and out, nice staff, great drinks and friendly people everywhere, after seeing the Miami night life this beats it, hands down Jimmy's IS THE TOP OF THE LIST FOR A GREAT TIME.. Disaster from start to finish. We spend € 175 pp and we where 9 persons with a total cost of € 1575 for NYE and we got the following: -The space is like a living room. -No DJ playing but a playlist. -Miserable toilets. Never again, would be the last place to visit on earth after hospital. Shame on you!!!!! Quite strange place. As a night club I absolutely didn't like it: music, rude staff, uncozy atmosphere. They also give a fitness classes here, but it looks like just collecting some money instead of providing a proper fitness class. Moreover, dirty and sticky floor, no fitness props, using nightclub furniture as steps/ holders, unprofessional set of exercises, 2 ladies on 1 fitness mat?!?!... all these tell everything by itself. My sister went to Amsterdam alone to see her favorite artist. She was at the front and felt very ill because of the crowd so she went to the toilet and threw up. A MAN went inside and threw her out of the club? She paid a LOT of money to go there, got sick (and yes - SICK because she doesn't even drink) but no one believed her. She is 18 years old, came from the UK to see BIG Bang and you literally just threw her out on the street when she was ill. When she tried to explain this the guards just ignored her. Very smooth guys. Crushing a girls dream without even listen to what she had to say. People - DON'T GO THERE. Went there twice during our trip in amsterdam. The first day was a thursday; good music, perfect amount of people and atmosphere. We had a great evening. But the second visit was the opposite... even though we had our stamp on the arm and showed it to the bouncer we couldn't get in. After 30 mins of waiting we finally were able to get in again.. there were way to many people on both floors; one was not able to walk 3 meters. Furthermore some of us got badly insulted without a reason. That's why I would go there between monday and thursday and not friday or saturday night. Best regards.